Thanks to the school children who put white crayons in the freezer, placed ice cubes on the porch, and wore their pajamas inside out last night, freezing weather has delayed pop quizzes for a second day. Indeed, the snow has descended, the temperature is below freezing, and the cars are crashing. 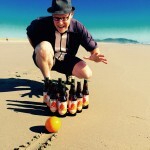 What is a craft beer lover to do during Icezilla? Peaks and Pints’ first thought is of dark beers. Their flavor tends to be big and chewy and demands that you slow down and savor them. After all, when a cold wind is whipping around outside, who wants to be gulping down cold ones? No, when you are sitting next to our fireplace, you want a drink that you can slow down with and sip contemplatively while you stare and the flames and consider your mortality. Besides being sipping beers, the big, dark styles tend to taste good whether they are cold or warm. You can let a glass of stout sit in your hand and warm up, and it is often more delicious as it was when you grabbed it out of the fridge. For our daily beer flight we present a flight of dark beers we call Craft Beer Crosscut 2.5.19: A Flight For Icezilla. In 2006, Chris Nemlowill and Jack Harris flew to Virginia Beach, Virginia to salvage an 8.5-barrel Saaz brewing system and drive it across the country to install it in their soon-to-open Fort George Brewery in Astoria, Oregon. 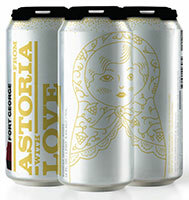 They went on to specialized in seasonal IPAs and stouts, including From Astoria With Love Russian Imperial Stout — the mother of Matryoshka, the stout to start all Matryoshka stouts. Creamy and smooth, From Astoria With Love delivers some bitter chocolate to balance the cocoa sweetness, plus a deep roasted backbone. Icicle Brewing Co. sits in the Bavarian theme park known as the city of Leavenworth, which seems perhaps the most appropriate place for a brewery. Owner Oliver Brulotte, who has deep family roots in Washington’s hop farming history, basically launch the Wenatchee Valley’s craft-beer boom. The brewery draws their water from nearby Icicle Creek, a run-off from surrounded by numerous mountain ranges including the Stuart Range and Wenatchee Mountains. And, Icicle Brewing makes a liquid German chocolate cake, Dark Persuasion. 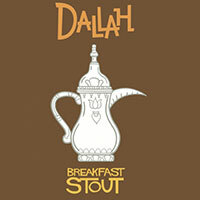 Seriously, this stout tastes exactly like German chocolate brownie, with strong chocolate and coconut notes, a touch of vanilla and a smooth finish. Like Dortmunder, Adambier came from the city of Dortmund, in Germany. But while Dortmunders traditionally hover at around 5 or 6 percent ABV, Adambier’s pack a 10 percent ABV punch or higher. It’s basically a strong, dark, hoppy ale extensively aged in wood barrels. It’s said in the 19th century, King Frederick William IV of Prussia visited Dortmund and some Adambier put him under the table for more than a whole day. Hair of the Dog Brewing Co. Brewmaster Alan Sprints goes to great trouble with this Adambier flagship beer, which he simply calls “Adam.” Each batch is numbered, and the carbonation comes from krausening — a traditional German method for carbonating beers without using sugars or other adjuncts. Instead actively fermenting malt wort is added to the fermented beer to provide the malted sugars needed for carbonation. It’s made with Northwest hops, organic Pilsner malt, and a variety of specialty grains for rich and smoky flavors, with notes of chocolate and dark fruit. 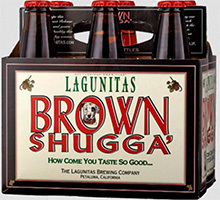 Brown Shugga was created in 1997 after Lagunitas Brewing brewers attempted to rescue a failed batch of Olde GnarlyWine Ale by adding “boatloads of brown sugar” — or so the story goes, anyway. Super sweet notes of caramel and brown sugar are yanked back by piney hops that kick in with a bitterness that intensifies for two or three seconds before starting to fade. When the beer is cold the hop bitterness is the dominant flavor, but it mellows out as it warms up letting the malts come through more.